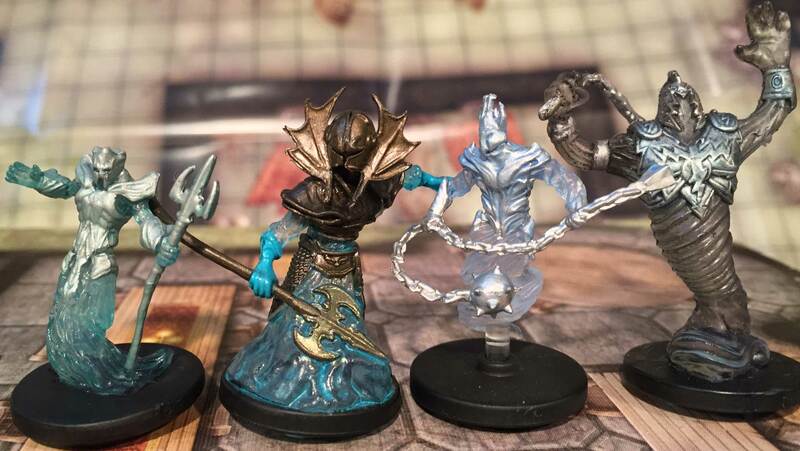 These minis are a solid purchase for most gamers, providing you with reasonably sculpted and painted plastic miniatures at an average list price of $4. 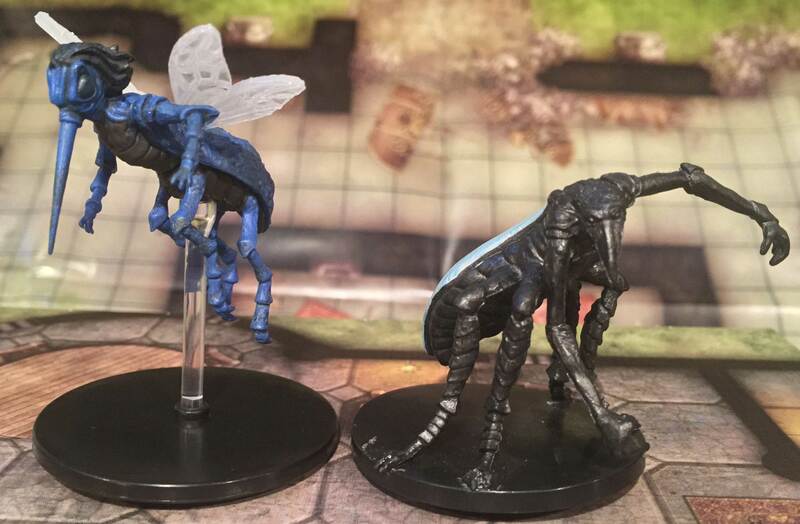 The minis are useful in home campaigns, previous 5E adventures, and especially with the Out of the Abyss adventure. 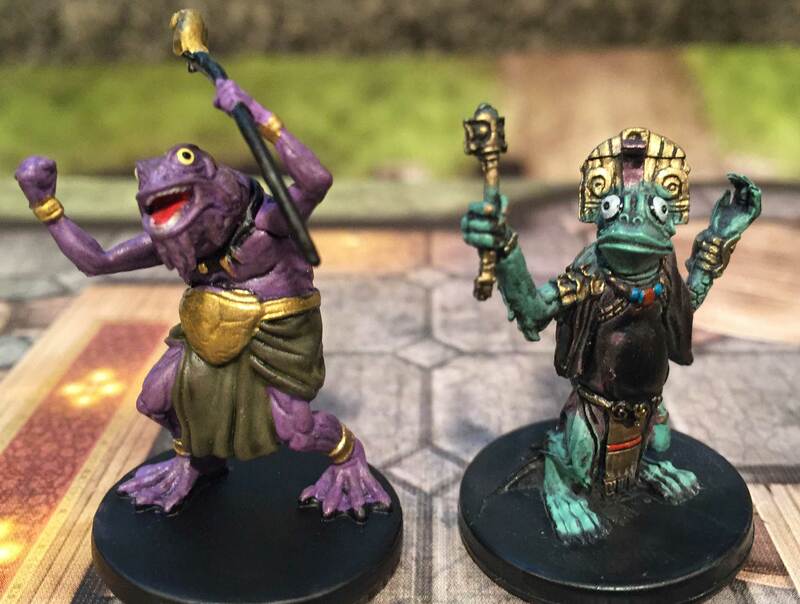 Just opening a few booster boxes can provide fun and useful prepainted miniatures. The quality is similar to that of previous sets. On the other hand, if you are a collector, this is the worst set in years! For the first time, and completely unannounced by WizKids, your case will not provide a full set and you will spend hundreds more to complete the set. This was a dirty move by WizKids and they should communicate such changes more clearly in the future! Many collectors and I were outraged and felt cheated by these changes. The set consists of 49 unique miniatures, sold in booster boxes of 4 randomized minis. You can purchase a “brick” of 8 booster boxes, or a “case” of 4 bricks (32 boosters). The booster’s $15.99 list makes it a relatively good purchase at your FLGS and I always like to support my FLGS when I can. You save a small amount on Amazon. Case purchasers should look into sites such as Miniature Market, which has a case for $300, bricks for $80, and boosters for $11. The set also has a “case incentive”, a gargantuan-based white dracolich ($35 on Miniature Market) which can be optionally purchased by any retail store or individual buying a case. Within the set, there are 13 Common, 19 Uncommon, 17 Rare, and 5 Ultra-Rare miniatures. Ultra-Rares are included in every other brick. This is worse than the previous two WizKids sets (13 C, 19 U, 12 R), making it harder to find rare minis. This set has a wide variety of monsters, favoring those found in the underdark, demons, and elementals. We will review most of the set later, and you can find the entire list on the excellent Minis Gallery web site. If you want a way to track your collection, check out my D&D Miniature Collection Tracker. The set is most useful for DMs, with PC minis confined to half-orc paladin, wood elf archer, shield dwarf wizard, human wizard, and 3 drow (scout, captain, archmage). This is fairly typical of recent sets. 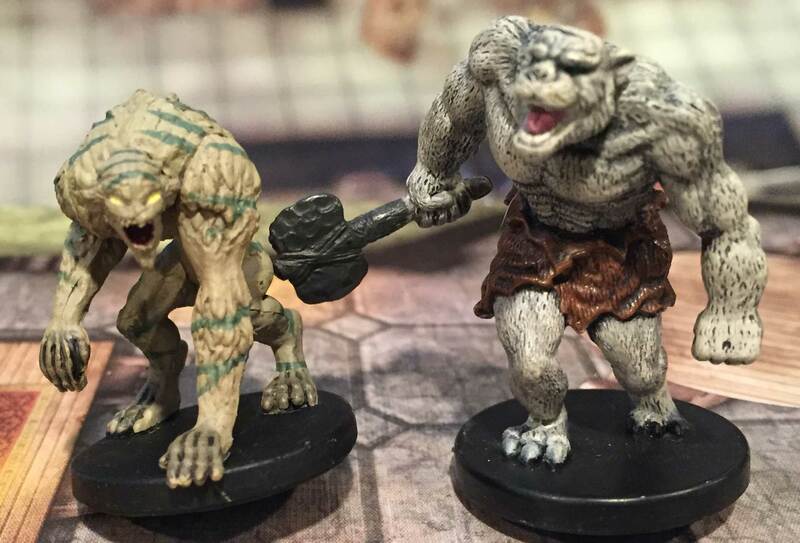 The PC minis are of sound quality, though the faces continue to be low on detail, with the paint blobbing over features rather than enhancing them. Serious collectors buy a case of miniatures, because it is expected to provide one of each rare and several of the other rarities. Manufacturers can’t promise one of each rare due to production variations, but cases are prepackaged by the manufacturer and contain 4 sequentially produced bricks with the expected distribution of miniatures. Previous WizKids D&D minis cases provided a complete set of at least one of all the minis in a set. Surprise! Without any announcement, WizKids changed the distribution so a case does NOT provide a complete set. I can’t overemphasize how dirty this feels. They absolutely know that case distribution is an expected parameter all collectors take into account. The previous sets in the series all provided a complete set in a case. How bad is it? Very bad. Of 17 rares I was short 5 (which makes sense: they added 5 more rares to this set but didn’t make them appear more frequently). 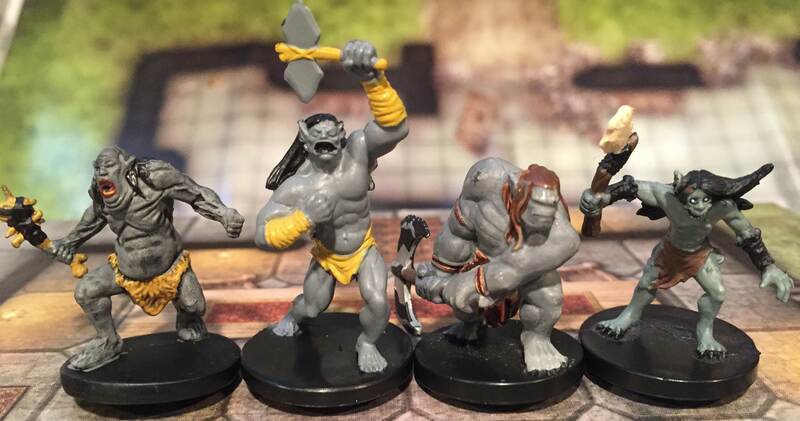 Several collectors report being short 6 minis. For me, purchasing those rare minis would cost $68 more! Ultra-Rares make this even worse. The previous sets used invisible PC minis as brick incentives, which are nice to have but are not critical. They had one in every brick, meaning you needed to hunt down 1 or 2 others. This set provides one in every other case, meaning you have to hunt down 3 more! The variety of ultra-rares is nice: invisible blink dog, human wizard, and mind flayer, plus shadow gold dragon and shadow beholder. 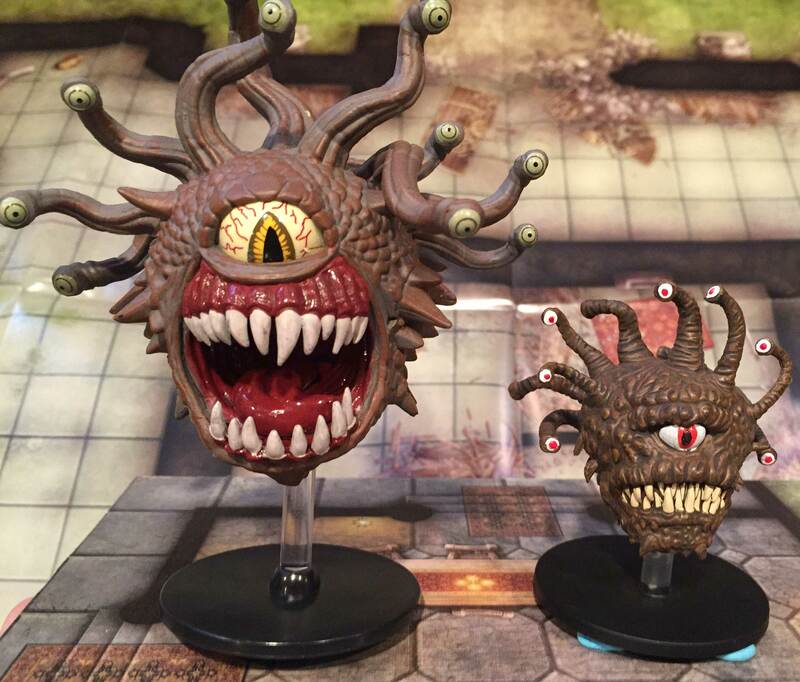 That beholder is $50 alone! For me, purchasing the missing ultra-rare minis would cost $115 more. 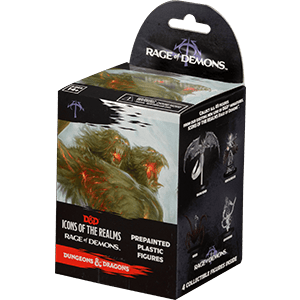 The price of a full set of Rage of Demons? $300 for the case and $183 or more for the missing rares and ultra-rares, for a total cost of more than $480! That’s a huge change in price from the previous set. Some of us thought this had to be an error. Contacting WizKids is a terrible experience. I attempted to reach them in many ways but in the end I had to give up. They seldom respond to Twitter, don’t respond to their own support site contact e-mail, and finally just admitted they made the change and then stopped communicating again. Wizards was actually really very responsive, listened, and were sorry that I wasn’t pleased. For these reasons, I can’t recommend a case to collectors. Just say no and join me in not buying a case of the next set unless WizKids changes their distribution for the next set. 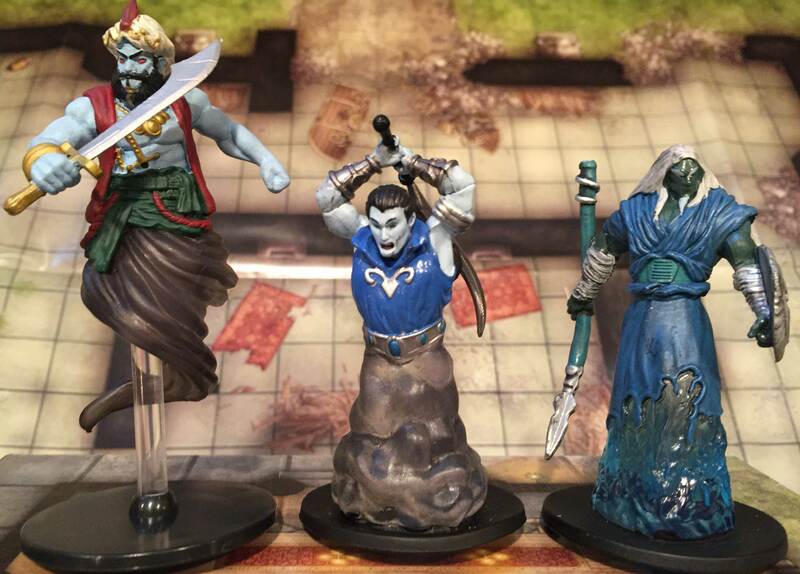 A good set of minis provides useful miniatures with a look that inspires play. 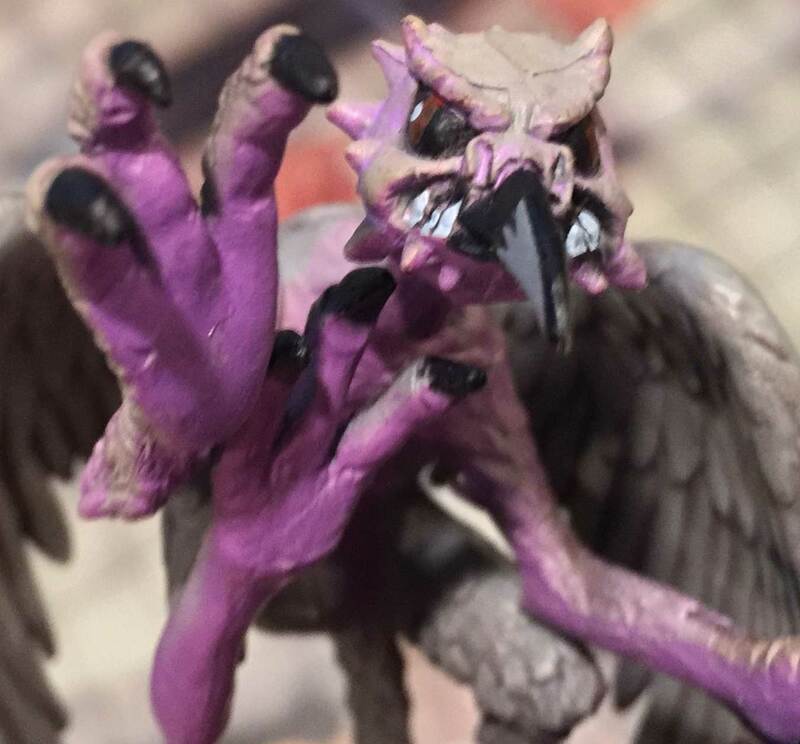 The best monster minis evoke a reaction from players when they are placed on the table and the best PC minis make their owner feel cool. In reviewing minis I look for that. I also compare the quality of the sculpt (3D details, great poses, etc.) and the paint (number and quality of colors, highlighting and shading). Comparing this set to previous sets gives us a feel for whether this set adds great value. I also want to see whether a new set adds to previous collections, making it easier to create diverse and exciting encounters. Without question, the best mini of the set is the rare Beholder. 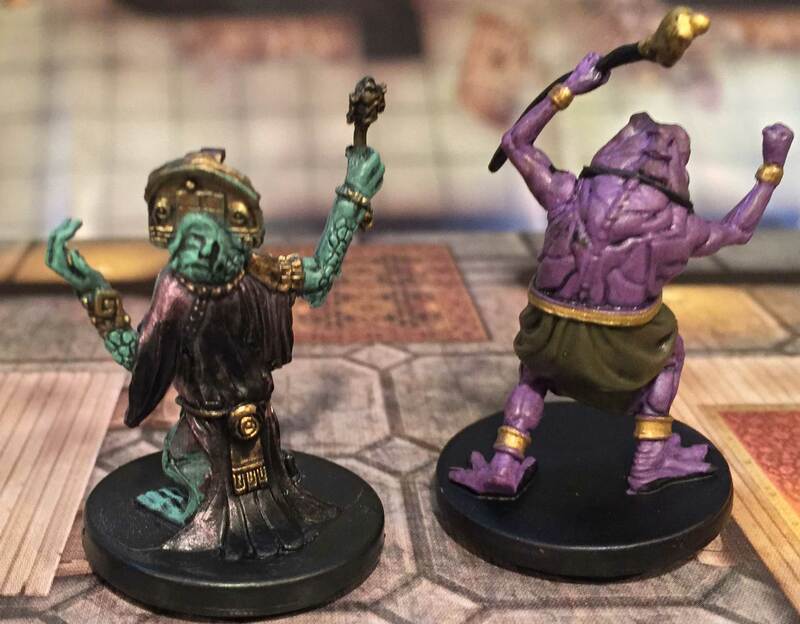 Unlike most other minis in the set, this one is more massive, more finely painted, brings more colors, and has greater sculpt quality than previous beholders. 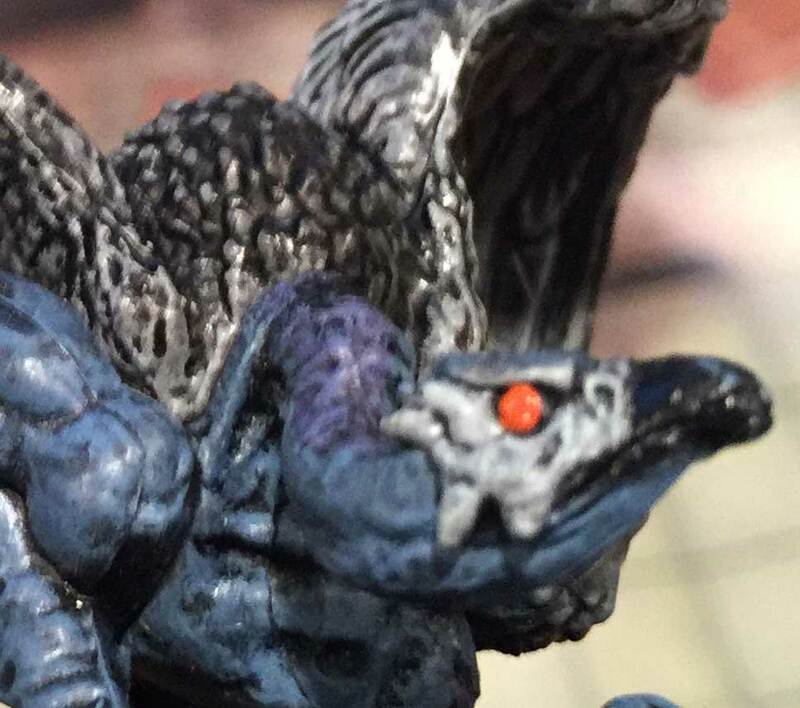 Whether compared to the Beholder Eye Tyrant found in the Collector’s Set (pictured) or to Deathknell’s beholder, this one is bigger and better. It also looks at least as cool as the more fantastic beholders previous sets have provided, including the Eye of Flame and Beholder Lich. Pull this out of the package and you want to start creating an adventure around it. Plunk this new beholder down and players will shudder! 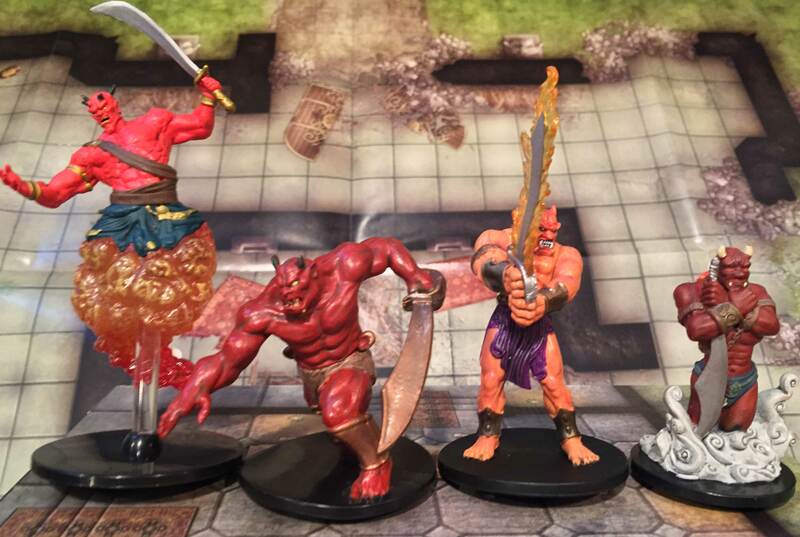 Runners up include the uncommon Efreeti and Djinn, mainly because they combine a lower body made of translucent fire or smoke effectively with WizKids’ love of stands. The stands can be pretty annoying, as they can be hard to push in and tend to fall out. WizKids seems to have tweaked their stands with this set. They fit more tightly and thus stay in a bit better. But, it often feels as if you could break the mini when pushing the stand in… WizKids minis are far more brittle than the old DDM minis. Two of my minis had defects, and both were around the slots for the stand. We’ve had some great elemental minis in past sets. You can see the efreeti from previous sets. I asked my son which he liked best. He chose the outer ones (new one and Angelfire). On the Djinn side, Legendary Evil’s version was almost as good as Rage of Demons’. I also included the Astral Giant from Lords of Madness, as it is one of my favorite minis. The picture doesn’t quite capture it, but the sculpt and paint quality are superb on both the LoM and RoD versions. While we are discussing elementals, the uncommon Air and Water Myrmidons are very nice. The new minis compare fairly well to the Archons found in Legendary Evils and Lords of Madness in 2009-2010. As with many minis in this set, and continuing a too-obvious WizKids trend, they are smaller than older minis with less mass (to cut costs) and tend to have less finer detail (the depressions aren’t as deep, the details and elevation changes less frequent). This is true of most of the minis in this set and of the last two WizKids sets. This image comparing the armor showcases the difference. The older water archon has finer armor details, with crisp edges instead of blob-like rounded features. (Click on any of the images in this article to get a larger image.) Despite WizKids’ changes, many of the minis in this set still compare well to older sets. DDM minis could also suffer from bad paint jobs and poor sculpts. 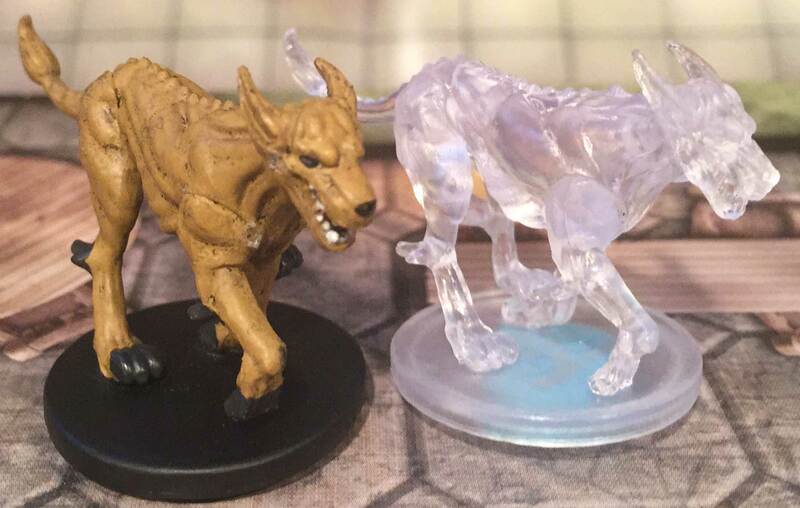 These two minis are great examples of the set adding something new to monsters that have appeared before. Night Below had a “Trained Carrion Crawler” with some nice detail (including a saddle! ), but Rage of Demons’ uncommon carrion crawler adds a really distinctive tan color and a great pose. 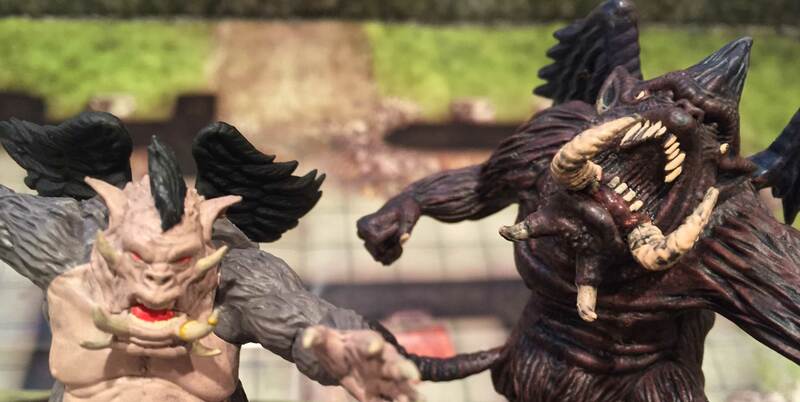 It gives the miniature more flexibility to stand in for all kinds of beasts or even in a setting such as Dark Sun! In the case of the rare Gnoll Champion of Yeenoghu, the pose, sculpt, and paint job is fantastic. It even compares favorably to Yeenoghu himself (seen on the right), from Lords of Madness. 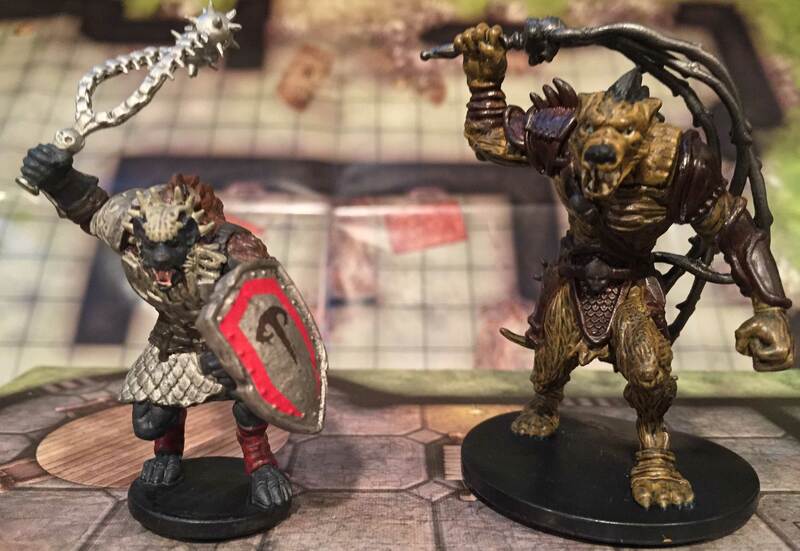 The new gnoll has some great details, such as skulls on its belt, fangs on its belt, and a painted shield. A clear leader to draw your party’s champion as a horde of other gnolls besets the rest of the party! There have been many quo-toa over the years. This set adds a purplish duo, contrasting with the green of previous sets. You can compare the two Kuo-Toa Archpriest from this set with the Whip from Night Below. Really cool, though the older one has more interesting and finer details, such as on the headdress and clothing. 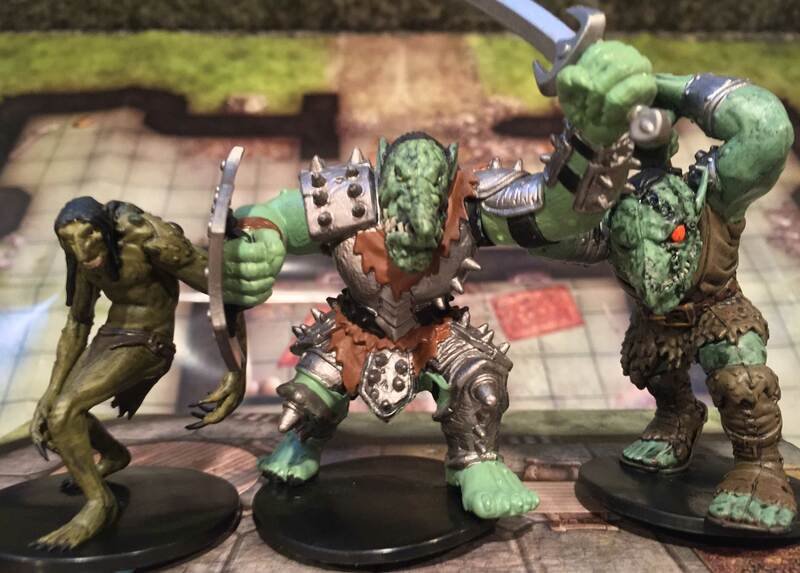 The regular Kuo-Toa (far left in bottom picture) is also sound, and is better to some but inferior to other older minis. The armor from the Kuo-Toa Hunter (second from left) in Night Below is really nicely detailed. Similar results can be found for the Quaggoth, Nightmare, and Lizardfolk. These are strong minis and often as good or better, though they often decrease in size and may lack the details of the best of their kind. Overall, they are great additions to a collection and help to add diversity to it. The lizardfolk are an exception, as I already have five other versions and many of them… and this one has a similar pose and equipment. Still, DMs running recent and current adventure paths will enjoy having these. RoD on the left, Aberrations center, Dungeon of Dread on right. A number of minis are on par with previous sets. 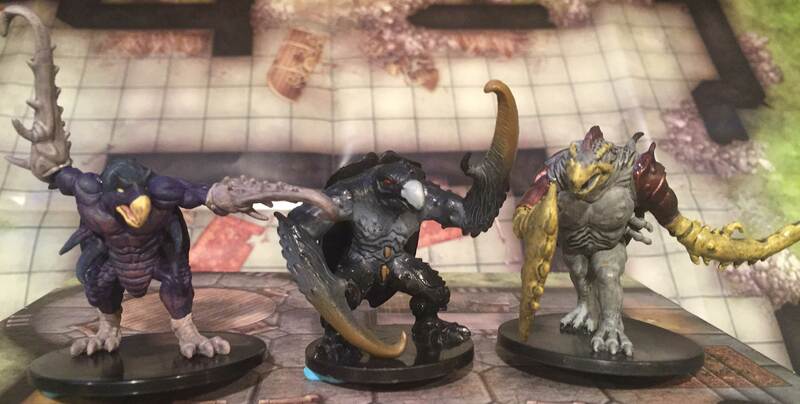 They can add variety to those owning the previous minis, but don’t really make your gaming session more impressive. The rare Hook Horror might be the best of the bunch. Slightly different colors for what is always a bit of a goofy creature… the owlbear of the underdark? One nice thing about it is the color variation. It actually blends purple, black, and rust on the chest area! If the face weren’t somewhat comical, this mini would rock. The Dungeons of Dread version remains my favorite. The rare Nalfeshnee, on the other hand, has inferior color and is far smaller (even an actual size category smaller, beyond the usual lower plastic quantity). The Lords of Madness version has these nice deep grooves and superior sculpting of the tusks, maw, and wings. Another example is the rare Helmed Horror. This should be a great miniature, with translucent red below and golden armor painted over, but there is no shading or highlighting and the translucent red is barely visible in normal light. The new Grimlock (far left) is the best of the grimlocks so far, and the shading is fairly strong. The Troll is solid, capturing the basics, which is good given that many trolls have so far tried to be different. It compares favorably to the War Troll (middle) and Troll Slasher (right), though that last one may be my favorite. It also avoids the insane size and fantastic almost comical appearance of the most recent two (see below). RoD (left), War Troll from Legendary Evils, Skalmad Troll King from Dangerous Delves (right). The Rust Monster is great (but a rare!) and the Cockatrice and Blink Dog are solid additions. The Spectator is a perfect rare… a mini you don’t need but which you are very glad to have one of if you pull it. One of the ultra-rares is the Invisible Blink Dog, which is a great nice-to-have. The Drider is reasonable, not far behind other sets and with a few aspects surpassing those of older sets. Still, a missed opportunity to actually improve. Top view, newest on left. Opinions will vary, but for me these minis fall short. All demons should be horrid fear-inspiring creatures out of nightmares, and the Vrock is the goofiest yet. I find the face to be comical or what I would expect to find in a kids’ fairy tale… not what I want to bring to the table for a demonic encounter. It brings the usual problems of less detail, lack of highlighting and shading, and lower mass compared to previous minis. It is on a flight stand, which can be nice (when it doesn’t topple over). I prefer the Archfiends and Dungeons of Dread versions by far, even if the pinkish Archfiends tends to collapse under its own weight… at least it has weight! The Chasme looks a bit like a whimsical fairy instead of a terrible demon. You get translucent wings, but I’ll take the Chasme from Bloodwar for its menacing pose and neat insectoid body. While I don’t expect a Dretch to inspire dread, this one shows another vast reduction in plastic mass and the features and size cause the face to be an almost detail-less blob. The Tyranny of Dragons set blew us away with amazing dragons. This set is far tamer. We get an okay Copper Dragon and Gold Dragon, plus the Red Dracolich (sure would be great if I had one in my case!). All of those are rares, plus there is an ultra-rare Shadow Gold Dragon which is just the same mini out of a smoke material and unpainted. We also have the case incentive, the “gargantuan” White Dracolich. This is a great mini, with white flesh stretched over flesh and bone, but it doesn’t have the awesome heft of those incredible Icons gargantuan dragons. This is unfortunately just the economic reality of minis and I doubt we will see future case incentives get any bigger. 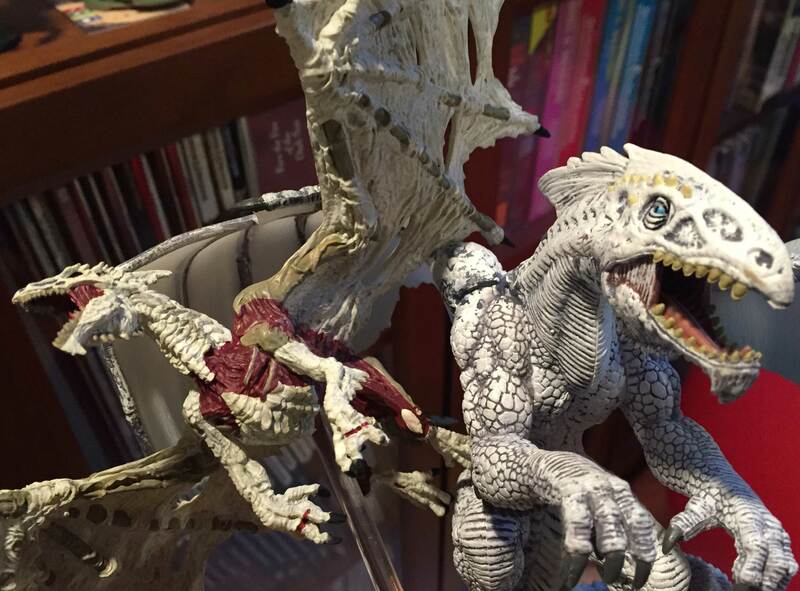 White Dracolich on left, old gargantuan White Dragon on right. Change the rare and distribution across cases so that a person buying a case will normally receive a full set. Ultra-rares should not be must-haves or super-expensive to chase individually. If you change distribution, let us know beforehand! Avoid large changes in mass for the bigger figures. The large, huge, and gargantuan minis look too small and thin across all WizKids sets, such that they aren’t impressive to use. Improve sculpt detail. Too often the sculpt is shallow and rounded, causing the paint to blob and detail to be lost. More innovation and differentiation! 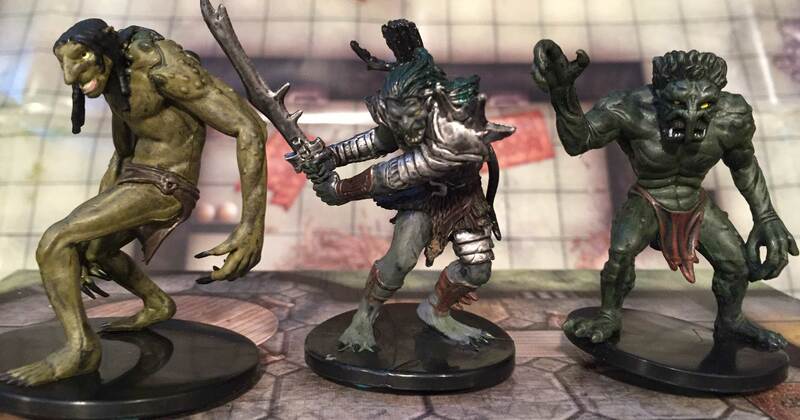 The efreeti, djinn, gnoll champion, and carrion crawler are great ways to give value even to the collector that has previous sets, because these minis bring something new that stands out. Keep improving the stands. This set is a bit better, but there is still room for improvement so that inserting stands won’t break a brittle miniature but will still stay put during play. Don’t make silly monsters. The chasme and vrock just aren’t imposing or fearsome, but they should be. Part of the reason I wrote this review is because I really love minis. I want to see them get better and for lots of gamers to want to buy them. D&D has had many iterations of metal minis, going back to 1977. Prepainted plastic minis began in 2003, with a whopping 17 sets of DDM miniatures. The economy changed drastically, with the raw materials escalating in costs. The line was changed in various ways for four more sets as WotC tried (and failed) to find a profitable model. Lords of Madness was the last DDM set in 2010. In 2014, Wizards launched the Icons of the Realms series, this time as a license to WizKids. 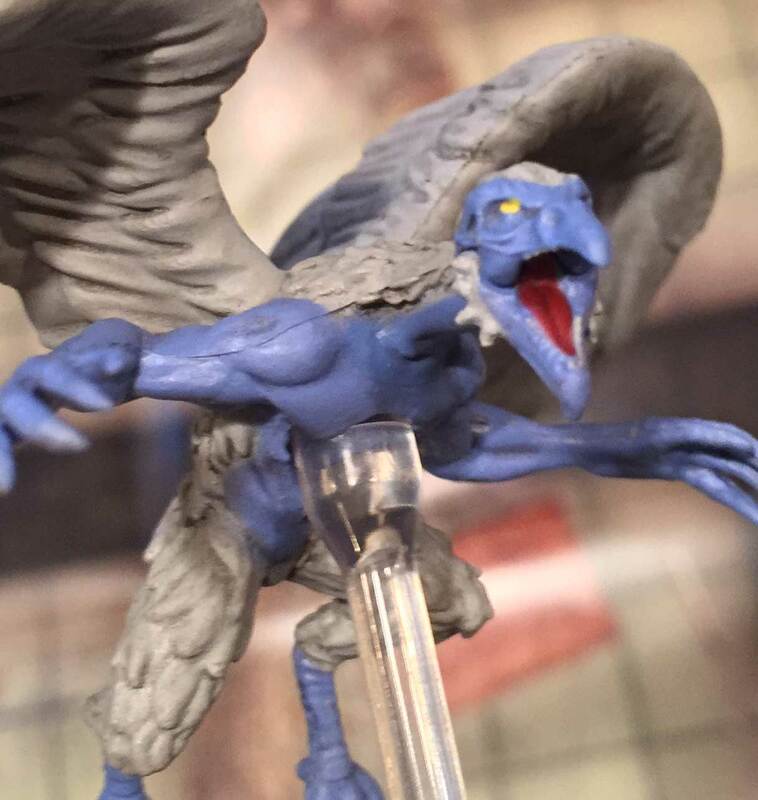 WizKids also has the license for Pathfinder miniatures, and both miniatures share the same benefits and problems when it comes to quality, sculpting, and paints. 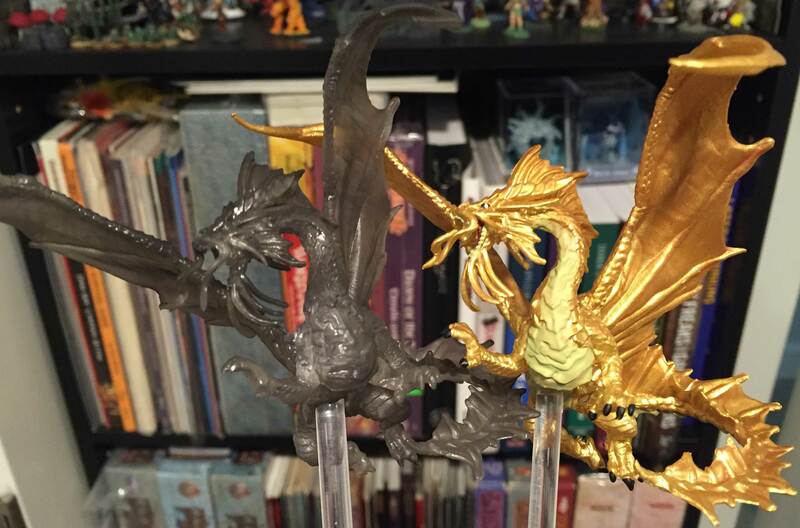 An important takeaway for the D&D fan is that making miniatures is surprisingly challenging. WizKids can leverage their size to reduce costs, but it is no guarantee that the line will continue or that it won’t change further. Want to read more? Christopher Burdett writes about the art he designed for the Spectator, and how it compares to the miniature in this set! This entry was posted on December 2, 2015 by Alphastream and tagged Miniatures.